La jetée (1962) is probably French director Chris Marker’s best known short film. A dark science-fiction story shot in black and white and using only stills, it has become cult and a reference for many film directors. 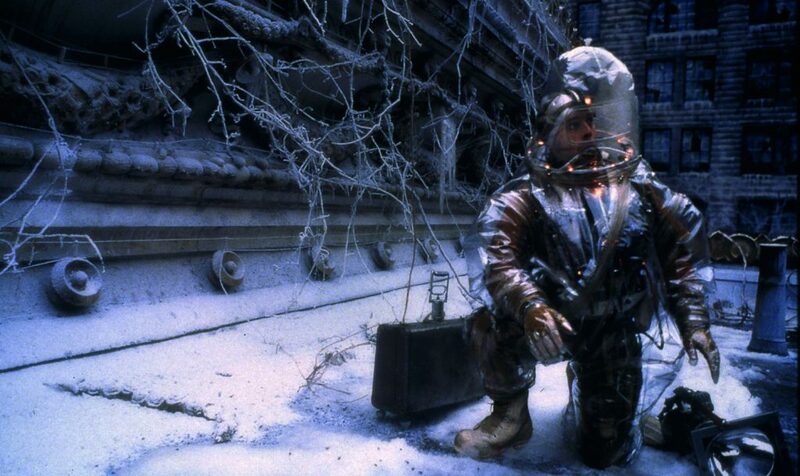 For instance, Terry Gilliam’s Twelve Monkeys (1995) has been directly inspired by La jetée. A strange cinematographic object, shot while Marker was working on another project, it has intrigued many critics, who have for the most part focused on the narrative and the form of the film. There is, however, another aspect which demands a closer study, which is the film itself, as an object constructed with objects. Denying the “true to life” identity of film – which Marker will explore through the documentary he is shooting at the same time – La jetée questions the notions of memory, history and power through an artificial construction that goes against the conventional definition of a moving picture. Given the deeply intellectual and political nature of Chris Marker’s film-making, this form goes beyond a mere “exercice de style” and points to a more crucial question, which is the true purpose of the film as an artefact, that is to say as an object designed to take a specific position in a specific field. Every study and biography of this French film essayist and director agrees on one specific point: Chris Marker is a mystery. Born Christian Hyppolite François Georges Bouche-Villeneuve in 1921, he filmed, translated and published under about 20 different pseudonyms, among which “Chris Marker” is the most famous one. He was very secretive about his personal life and avoided public appearances as much as he could. We know that he began his career as a writer and a supporter of Pétain’s youth organization in the early 40s, but rapidly joined the Résistance, of which he became an active fighting member. Right after the war, in 1946, he joined the team of the left-Christian intellectual review Esprit, worked as a world-travelling photographer and journalist (fig.1), and began working with film in the early 1950s. His film career is as eclectic as his life, mixing documentaries, short fiction films, false documentaries, mixed media works, etc. Impossible to classify in one genre, Chris Marker loved to experiment and use film as a way to oblige the spectator to re-think both his position and the position of the images he was watching. Fig.1. 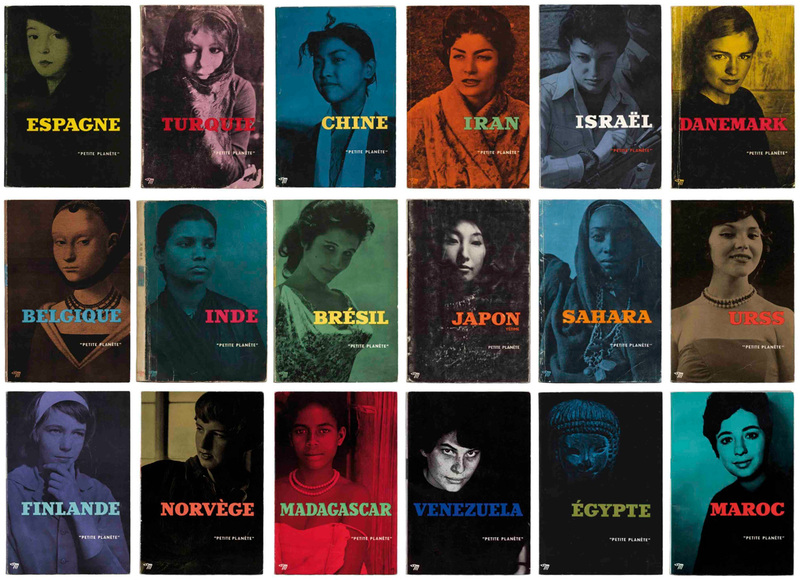 La collection “Petite Planète”, a series of travel books made in the 1950s and 1960s under the direction of Chris Marker. This confrontational strategy is obvious in his short film, La Jetée, which was released in 1962. A science fiction story about a man who in a post-apocalyptic and totalitarian future is forcefully sent back to the past by scientists, in order to seek help. The vector of his time-travelling is his most vivid memory, a woman he saw as a child in pre-war France, waiting for someone on the roof of Orly Airport. The memory is also a traumatic scene, as the man she is waiting for is killed in front of her eyes. The time-traveler meets the woman in the past, flirts and falls in love with her. Their love story is, however, brutally interrupted by the scientists of the post-atomic age, who decide to send the man in the future to get a source of energy to help the planet. Having brought back the infinite energy cell, the man realizes that he is useless now and that he will be executed. He is saved through a Deus Ex Machina, as a man from the future appears to him and invites him to join them. He refuses, but asks to be reunited with the woman from the past. He is to meet her on the roof of Orly Airport, and is shot by a spy from the post-atomic time that has followed him. He then realizes that the scene he has witnessed as a child was his own death. Many critics have focused on the peculiar form of the 27 minute film, which is composed of still black and white images – actual photographs taken while Marker was working simultaneously on another project, a documentary called Le Joli Mai – with a voice-over narrative. It is a non-moving movie picture, which Philippe Dubois, a specialist on Marker, calls a “cinématogramme” (Dubois, 2002). There are, however, many more aspects to be considered that make this work a singular object. The title, at first, is misleading. 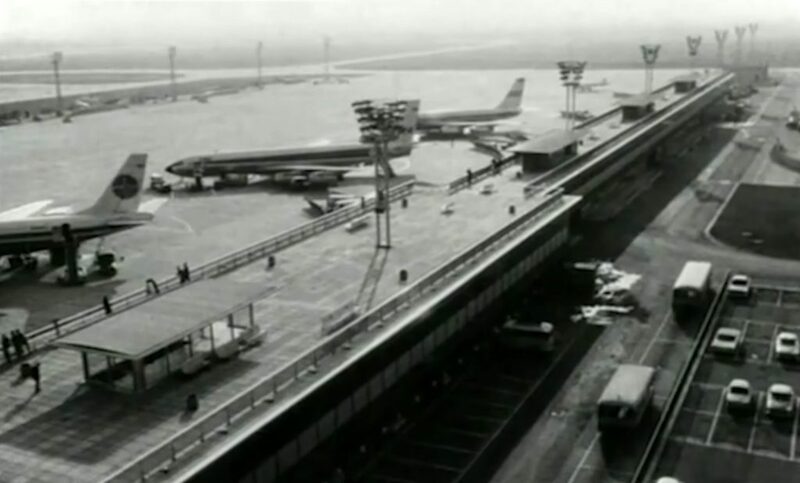 A “jetée” in French is most often associated with a jetty, a construction that is built on a seafront, but, as we immediately learn when watching the film, the monument here is a part of the Orly Airport. It is obvious that this semantic ambivalence is intentional and that the purpose is to eject the viewer (a critic even associated the term with the verb “jeter”, to throw, or to eject in French) (Mónica Alcalá-Lorente, 2014) from his or her comfortable position and put him in a Surrealist-inspired semantic interzone, where the sea is replaced by concrete, ships by airships and the sound of the ocean by the roar of the planes’ engines. The ambivalence of the title and the semantic shift implied create a superimposition of possibilities and realities that will be further developed in the short film (fig.2). Fig.2. The “jetty” at Orly. 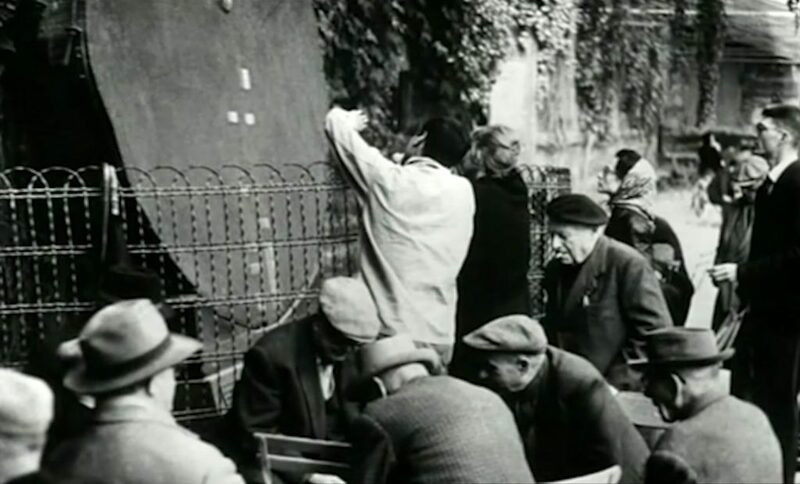 Another clue to this voluntary confusion is indicated by the film’s subtitle, “photo-roman” (“Novel-photo” in English). In France, there were a series of magazines that presented sentimental stories narrated through photographies. They were called “romans-photo” (fig.3). The inversion of the constituting words should not be seen as a mere “jeu de mots”, but rather as an indication of a subtle irony (which Marker is known to be familiar with) pointing at a subversion of “genre”. What’s more, these magazines also adapted films into their format, “freezing” their movement into still pictures. The readers’ imagination would then recreate the film, in almost exactly the same manner as with La jetée, but in reverse – going from the movement of film images to the entropy of photography. Fig.3. The subtitle “photo-roman” evokes the popular genre of “roman-photo”. Another obvious reference to the non-moving images is also comic strips, and the main character wears a t-shirt with the name of a comic-book wrestler, “The Saint” (Catherine Lupton, 2005). The alliance of two popular genres, science fiction and comics is also everything but accidental. As if to stress the obvious, the protagonist is also wearing jeans and a U.S. Army jacket (fig.4), allowing Marker to set the story in a pre-established cultural meme, which is itself linked with youth, memory and transnational culture. Fig.4. 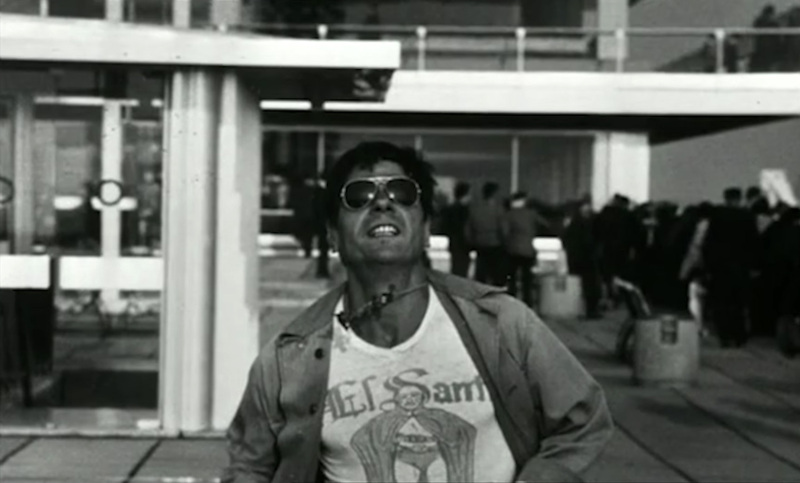 The protagonist wearing a “The Saint” t-shirt and a U.S. Army jacket. Memory and memories are also omnipresent in Marker’s films and works. From the documentary of Les statues meurent aussi to the CD Rom of Immemory, nearly all of Marker’s works deal with memory. La jetée is no different, as a memory – the main character’s childhood impression of a woman’s face – is the central element of the narration. The man is chosen for the experiment, precisely because he has a vivid memory of the past, which can be used as a key to unlock a time-passage. The image is therefore a starting and an arrival point – both for the protagonist and the film itself. However, at the same time, Marker visually plays with the viewer’s own memories as the pictures of Paris in ruins and the strange conversations in German of the scientists conducting the experiment are reminiscent of World War Two. The memories are therefore equally “real” and “unreal”, both for the main character and the viewer. “Real” because of History, personal and general, “unreal” because the protagonist’s image is incomplete as he ignores until the end that he was witnessing his own death, and because World War Three hasn’t yet occurred at the time the viewer is watching the film. One important aspect, though, is that in La jetée, memory is an anchor point, and not a fluctuating, unstable image, constantly under re-construction. If the main protagonist is at some point described as “confused” about the moments he is experiencing, it is because he is living a completely new story with this woman who he only remembers from his childhood. But she is nonetheless the same woman. 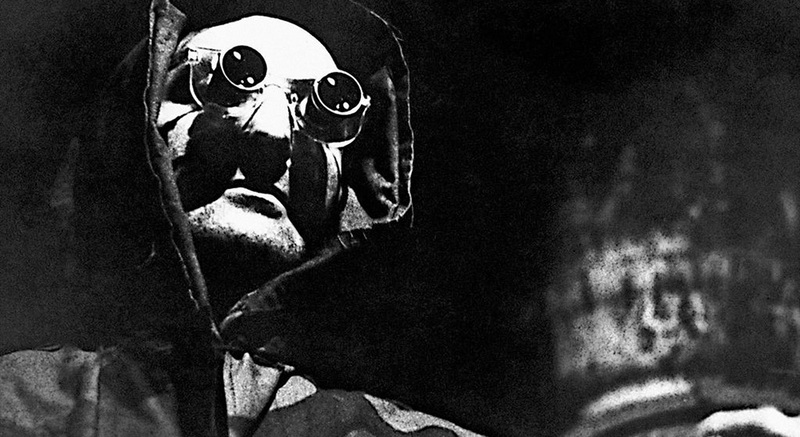 In La jetée, memories don’t lie, even if they can be used – and misused – by a dictatorial power. This becomes obvious if we look at some of the objects the protagonist and his girlfriend encounter while talking and walking together, namely some graffiti – described as “signs on the walls” by the voice-over narrator (fig.5) – and the section of a sequoia tree in a park. Fig.5. Skulls among the “signs on the walls”. 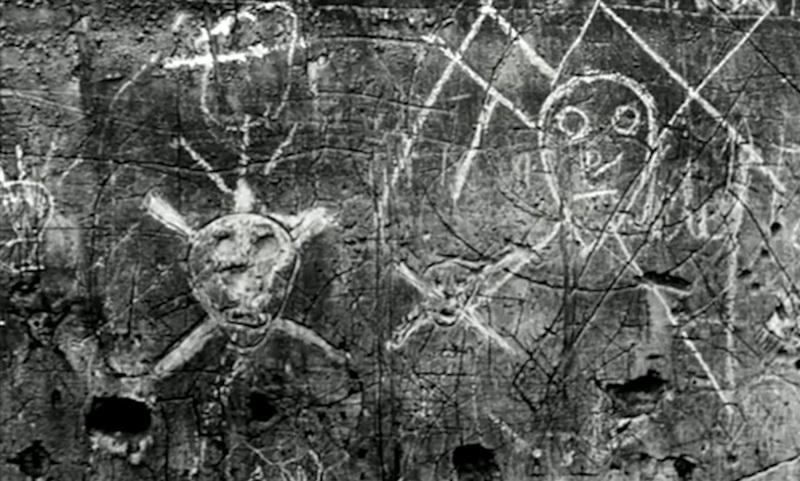 One of these graffiti represents skulls, which is a beautiful paradoxical image, as they symbolize both the past – one engraves something on a wall in order to leave a trace – and the future, as the skulls can indeed be read at an ominous “sign”, predicting the protagonist’s (and civilization’s) tragic future. It is inscribed in stone, another common symbol for time and its passing. Memory is therefore linked with the mineral, which is both natural and used by mankind for the construction of its cities and empires. Later, the characters take a stroll in a park, which still exists today and is easily recognizable for a Parisian – the Jardin des Plantes, located on the eastern edge of the Latin Quarter, in the 5th arrondissement. They stop in front of a sequoia tree section which was located at the entrance of the Nature History Museum (and which is now part of the recently re-opened xylolibrary) and have a discussion about time, symbolized by the various circles of the tree (fig.6). Fig.6. The man and the woman pausing at the cross-section of a sequoia. 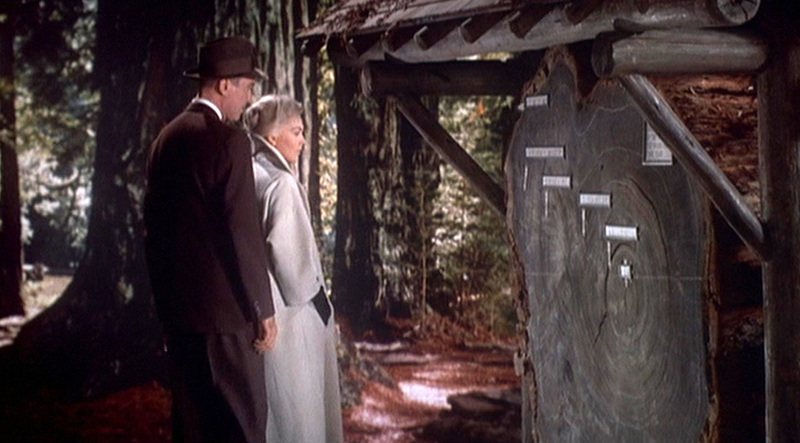 As often noted by critics, this scene also clearly refers to a similar scene in Alfred Hitchcock’s Vertigo, which is also based on the subject of memory, but is only noticeable for the viewers who have seen Hitchcock’s film and remember it (fig.7). The sequoia section is thus a memorial vector within the fiction of cinema, a visual imprint marked in the history of the media itself. It is both a reference and a proof of the materiality of memory. Fig.7. A similar scene in Hitchcock’s Vertigo. These two highly symbolic objects are crucial in the narration because they set memories as undeniable phenomena. The graffiti proves that one can be remembered by etching symbols or initials on a wall, like art artifacts remind us of past civilizations (and there are also pictures of statues to stress this idea in La jetée (fig.8). Memories are part of a general memory, both as a product and a counter-product of time. We are part of a historical flux, in which we set our own pictures, which can both confirm or modify the general narration, but cannot deny its reality. But the reverse is true too: historical memory cannot deny personal souvenirs. The use of stills in the narration accentuates this idea, with the particular insistence in the narration upon the singular aspect of the memory – the non-moving, still image of the woman forever engraved in the protagonist’s mind. Fig.8. 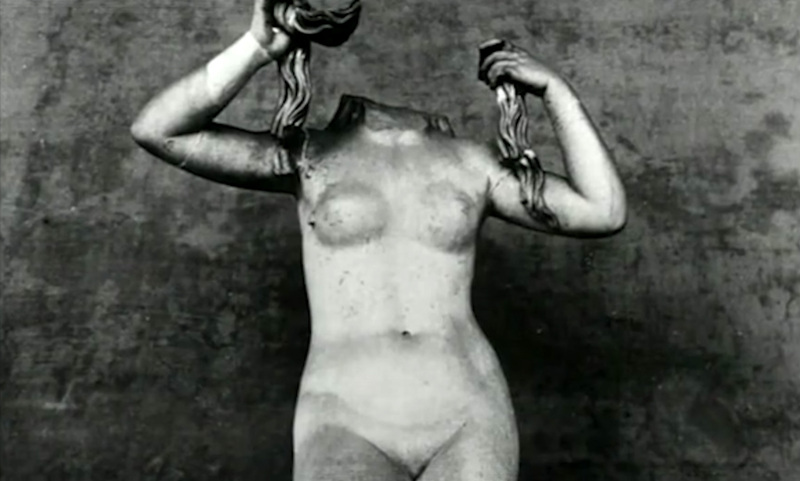 An image of a statue in La jetée. A photo is therefore as real an object as the graffiti, the statues or the sequoia section in the film. The artifacts that define memory are stable – it is time itself which becomes unstable in the course of History. Paradoxically, this is precisely why the main character is chosen by the scientists of the future: his memory is so stable that it is a perfect key for time-travelling. Here, we have to remember that if the protagonist is sent back into the past – and later into the future – it is against his will. Although not described, the post-apocalyptic civilization living under the Palais de Chaillot is anything but totalitarian, using humans for experimentation like the Nazis did in the concentration camps. We are told, for instance, that many subjects have died or become insane and the scientists discuss in German. Power, in La jetée, is definitely the “coldest of all monsters” that Nietzsche described, so limitless that it can influence time and use its citizens’ most intimate belongings – memories – for its own purpose. If the reason of these experiments can appear legitimate – it is to survive – the means employed are barbaric and close to torture. La jetée, with its tragic ending, could appear as a completely pessimistic fable, and it is definitely the way Terry Gilliam understood it when he adapted it in his film Twelve Monkeys (fig.9). There is, however, an alternate way of looking at it, which goes beyond optimism and pessimism, and pushes the work towards another direction. Fig.9. Twelve Monkeys (1995), Terry Gilliam’s adaptation of Marker’s La jetée. As stated before, memories are symbolized as singular objects in La jetée, both as non-moving stills and photographed objects. 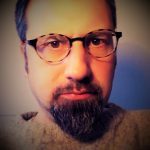 The film, by refusing the conventional definition of a moving picture – it is, once again a “non-moving moving picture” – becomes a specific, unique object itself, which leaves the traditional (and forgettable) field of conventional cinema to enter the domain of art. La jetée can thus appear as a mnemonic artifact, especially designed to become, through its unusual form, “unforgettable”. La jetée is indeed a tragedy, but the main’s protagonist’s death is as necessary as the Poet’s demise in Jean Cocteau’s Le Sang d’un Poète (fig.10), which Marker admired, because it is the only way to attain immortality. Fig.10. 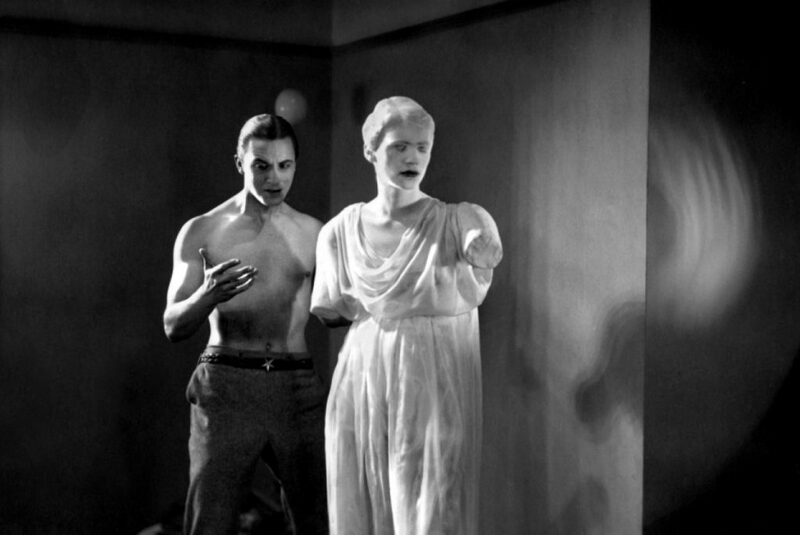 Chris Marker admired Jean Cocteau’s experimental film Le Sang d’un Poète (1932). Alcalá-Lorente, Mònica, “Mecanismes cientificotecnològics de control social a «La jetée» (Chris Marker, 1962)” in Ciència i Ficció, L’exploració creativa dels mons reals i dels irreals, edicions Talaiots, Barcelona: 2014. Dubois, Philippe, ‘La Jetée de Chris Marker, ou le cinématogramme de la conscience’, in Théoreme, 6, ‘Recherches sur Chris Marker’, Paris: 2002. Lupton, Catherine, Chris Marker: Memories of the future, Reaktion Books, London: 2005.